We’re done testing the battery endurance of the new Samsung flagship and we are ready to share the results with you. The I9300 Galaxy S III has a huge 2100 mAh battery, but its 4.8″ HD Super AMOLED still causes concern. It was also interesting to see how the new-generation Exynos 4212 Quad chipset fared. It has no companion core to handle less demanding tasks, but all of its four Cortex-A9 cores are built on a 32nm process, so they should be pretty efficient. As usually we started with the 3G talk time test which the Samsung I9300 Galaxy S III put up pretty great performance. 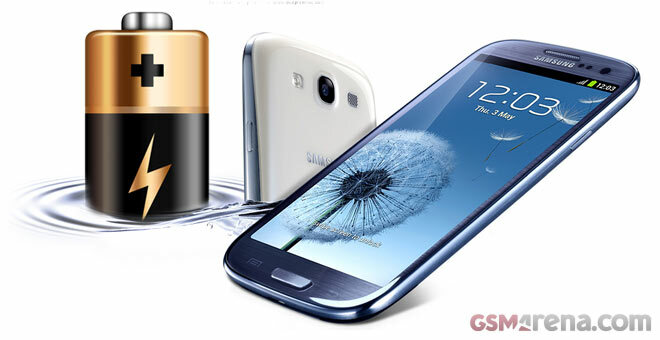 With the screen kept off, the S III made its huge battery count and survived for a whopping 10 hours and 20 minutes of constant talk done on a single charge. Knowing how badly the predominantly white web pages normally treat AMOLED screens, we didn’t really expect the Galaxy S III to rule our browsing test. In reality it managed 5 hours and 17 minutes, which guaranteed it a position in the middle of the pack. That’s not quite flagship performance, but it’s better than we expected. Finally we come to the video playback part of our test, where we saw another amazing result from the Samsung I9300 Galaxy S III. The smartphone required a minute over 10 hours of continues video playback to drain 90% of its battery. This should make the S III a great travel companion on those long flight and train trips. 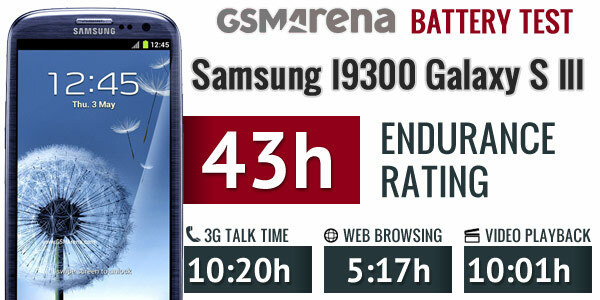 The Samsung I9300 Galaxy S III also had a pretty good stand-by endurance, which, combined with its great performance in the individual tests, helped it achieve an endurance rating of 43h. This suggests that you’d need to charge the monstrous smartphone once every 43 hours if you do an hour of 3G talking, video playback and web browsing per day.